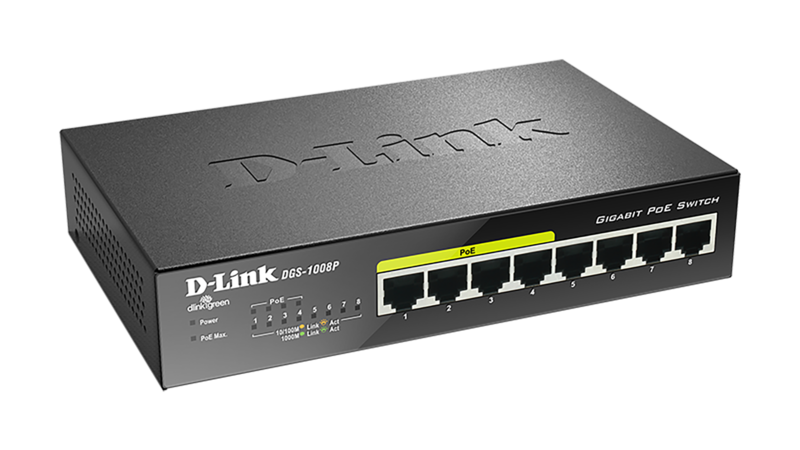 The D-Link DGS-1008P offers an economical way for SOHO and small to medium businesses (SMB) to benefit from the increased bandwidth of Gigabit Ethernet It provides 8 Gigabit ports for fast server deployment to meet increasing network loads. 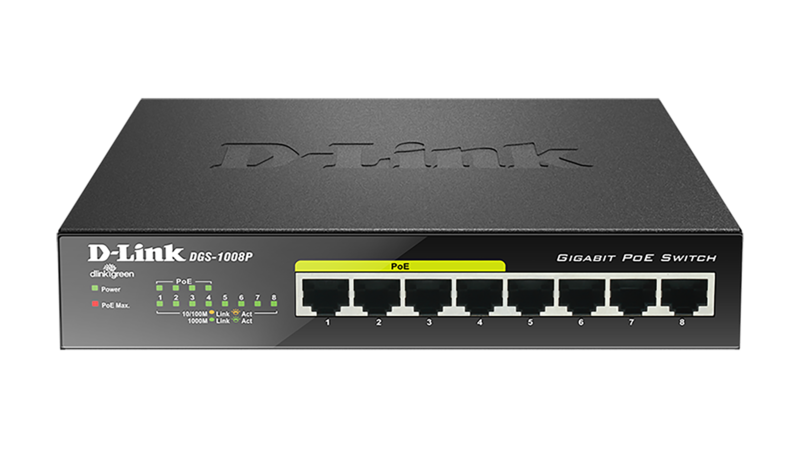 The D-Link DGS-1008P 8-Port Gigabit PoE Unmanaged Desktop Switch enables home and office users to easily connect and supply power to Power over Ethernet (PoE) devices such as wireless access points (APs), IP cameras, and IP phones. It also provides the opportunity to add additional Ethernet devices like computers, printers, and Network Attached Storage (NAS) onto a network. This compact PoE switch operates quietly, making it ideal for use in virtually any room or office. All ports support automatic MDI/MDIX crossover, eliminating the need for crossover cables or uplink ports. Each port can be plugged directly to a server, hub, router, or switch using regular straight-through twisted-pair Ethernet cables. The DGS-1008P makes use of D-Link GreenTM eco-friendly technology, providing energy savings, reduced power consumption, and a longer product life without sacrificing operational performance or functionality. This switch helps to conserve energy through methods such as Link Status and Cable Length Detection. The Link Status feature automatically powers down ports that have no link, allowing the switch to save substantial amounts of energy by cutting power for unused ports. It can also detect connected cable lengths, and adjust power usage accordingly. In addition, the fan-less design extends the product’s life and also reduces noise. The first four ports of the DGS-1008P support the IEEE 802.3at PoE protocol. Each of the four ports can supply up to 30 watts, for a total PoE budget of 68 watts, allowing users to attach an IEEE 802.3at-compliant device to the DGS-1008P that requires no additional power. Use PoE+ for applications that are far from power outlets or when you want to minimize the clutter of extra cables. The compact design of the DGS-1008P allows placement in most locations, including those where space is at a premium. 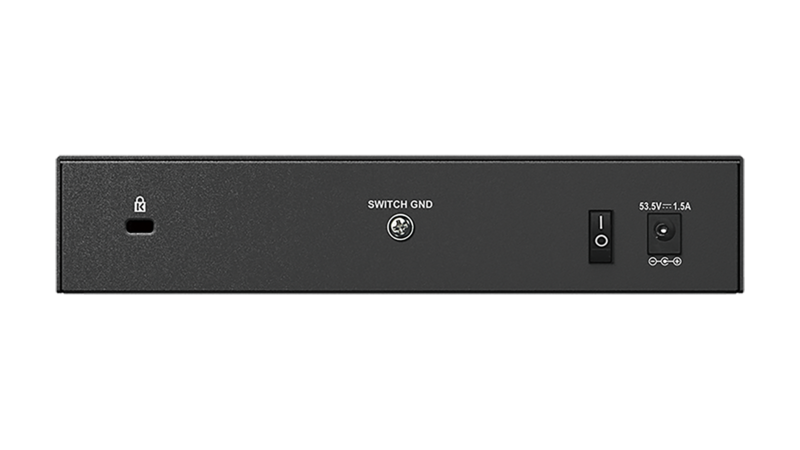 The desktop form factor provides everything you need to set up a new network or expand an existing network, while the fanless design ensures silent operation even in noise-sensitive workstations and meeting rooms.